This luxurious shadow blue frost fox boa with real fur is a beautiful accessory for the upcoming season. The Scandinavian foxes are soft and warm. Fashionable bluefrost fur boa in natural colors, made with the best Scandinavian fox skins from SAGA Furs in Finland. The product was made at our workshop in Kiel. Golden island foxes fur boa made our of fox tails. The foxes are farmed foxes from Scandinavia from the SAGA Furs auction in Helsinki, the boa was made in Germany. Canadian fur boa from wildcross foxes is the perfect piece for an elegant gala evening. Contact us at any time if you have questions about the fur boa. Red fox real fur muff - Muff bag material: 100 % down. Worldwide delivery! "Raccoon fur scarf in green - Easy to wear and pair with other clothes, fashionable and stylish. As such, this raccoon fur scarf will usually see the most active during autumn and winter, with a few appearances in the spring, as well. 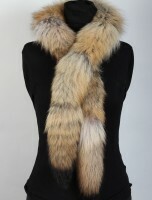 Raccoon fur scarf in multicolor - Ideal for an evening event and great as a warm scarf during cold months. Our raccoon fur scarf is perfect for chilly evenings or air-conditioned places when you need a little extra warmth. Beautiful rex rabbit fur muff in white, made with soft and fluffy rex rabbit pelts. The filling is goose downs, very hand warming for cold days and evenings. Soft Raccoon Muff in a beautiful natural colour and down muff. In our Online-Shop you can find more fur muffs like rabbit, fox, mink or lamb muffs. Rabbit Fur Muff in black - Muff bag material: 100 % down. Worldwide delivery! Soft SAGA blue fox fur collar in a dark brown tone, the perfect match for elegant evening wear for special gala evenings - made by our master furriers in Germany. Luxury Shadow Fox Muff in a beautiful natural white tone. In our Online-Shop you can find more fur muffs like rabbit, fox, mink or lamb muffs. Rustic fur collar made from real Canadian coyote furs. The color is 100% natural, and this fur accessory will freshen up your style for a gorgeous new look. This raccoon fur collar is made with wild Canadian raccoon skins from Fur Harvesters. The collar has a great natural color and a very soft touch. Freshen up your wardrobe with this modern red fox fur collar, made by the Master Furriers at Paustian International Furs in Germany. Genuine Mink Muff Bag in a fine dark brown colour and a 100% down muff. Order now in our Online-Shop and find more fur muffs like fox, rabbit or lamb muffs. This Russian bargusin sable fur collar is a high-class fur accessories. We only use the best sable skins from Russia for our fur products. Luxury Blue Fox Fur Muff in a beautiful natural grey tone. In our Online-Shop you can find more fur muffs like rabbit, fox, mink or lamb muffs. Luxury Silver Fox Fur Muff in a beautiful natural black and grey tone. In our Online-Shop you can find more fur muffs like rabbit, fox, mink or lamb muffs. Freshen up your style with a gorgeous SAGA silver fox fur collar from Master Furrier. Browse through our product range and discover all of our fur collars. Lightweight SAGA fawn light fox fur collar made with high-quality Scandinavian foxes. The color is elegant and modern, perfect for an opera evening. 940 Gorgeous muff made of 100% genuine SAGA blue frost fox furs (Origin Assured). Rex Rabbit Fur Muff in brown with interior bag - muff bag made of 100% down. Worldwide delivery! Two in one: warming mink muff with integrated bag. Material: mink. Colour: natural. This mink muff bag is available in different sizes as well! Just emal us with your desired size. Chic mink fur collar made with superior mink skins in a warm dark brown tone. The mink collar was handcrafted in Kiel, Germany. Gorgeous Russian sable fur collar. Handcrafted from two Russian sables. With a fur fastener. We can also make this collar without paws - without extra charge! Free-hanging sable tails made of 100% authentic Barguzin sable give this bag a feeling both of wildness and refinement - the perfect combination of wild distinction and pure luxury. Made of 100% authentic Barguzin sable, our handbag offers the perfect combination of wild distinction and pure luxury. Free-hanging sable tails give the bag a feeling both of wildness and refinement.